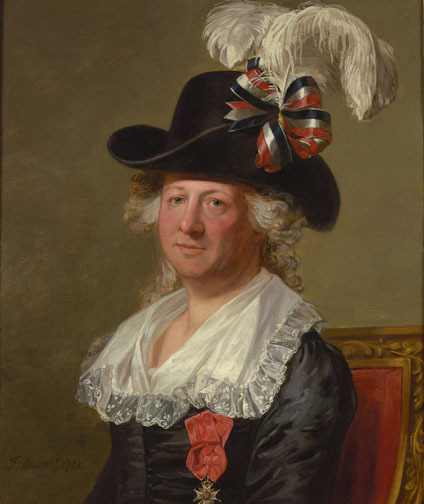 What better time – Gay Pride Weekend – to hang up a painting of Charles-Geneviève-Louis-Auguste-André-Timothée d’Éon de Beaumont. We can’t say whether or not he was gay, but the Chevalier d’Eon certainly enjoyed dressing up in women’s clothing. The chevalier had quite a career – French diplomat, spy, soldier and Freemason. His first 49 years were spent as a man, the last 33 years as a woman. Upon death, a council of physicians discovered that d’Éon’s body was anatomically male. This 18th century painting was sold in New York to a British gallery as a “woman in a feathered hat”. Not so. It turned out to be our chevalier, the earliest known painting of a transvestite. The portrait now hangs in the British National Portraits Gallery, just off Trafalgar Square. This entry was posted in Art & Design and tagged Chevalier d'Eon, first painting of a transvestite, London, National Portraits Gallery. Bookmark the permalink.